In March 2018, the American corporation LegalShield added a “Gun Plan Supplement” to its list of legal services products. One aspects of the supplement is “murder insurance” for shooters who kill someone and need legal advice and representation in order to avoid charges, indictment and/or conviction. LegalShield markets pre-paid legal plans through a network of 6,900 independent provider attorneys across the U.S. and Canada. In the wake of the Parkland shooting, LegalShield CEO Jeff Bell thought it was a good idea for his company (est: 1972) to start offering murder insurance to “Stand Your Ground” shooters. 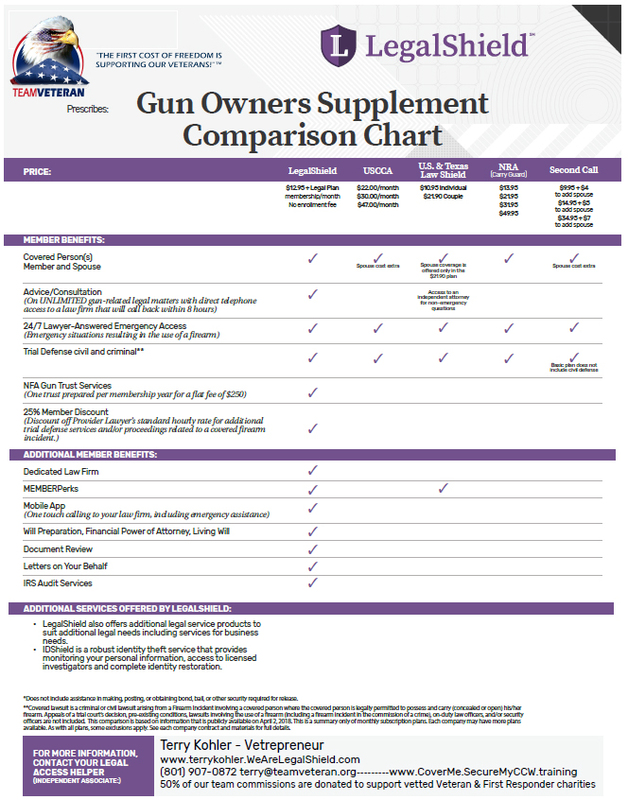 LegalShield is distributing a “Gun Owners Supplement Comparison Chart” to show how their murder insurance plan is competitive with those offered by the NRA, U.S. Concealed Carry Assocation, U.S. & Texas Law Shield, and Second Call. To make matters worse, LegalShield is also helping customers establish trusts for the purpose of acquiring fully automatic machine guns regulated under the National Firearms Act (NFA). I was absolutely horrified to learn that LegalShield started selling a Gun Owners Supplement plan that includes murder insurance for “Stand Your Ground” shooters just days after the mass shooting tragedy at Marjory Stoneman Douglas High School in Parkland, Florida. Mr. Bell, this decision makes me question both your judgment and character. It is incredibly insensitive to victims and survivors of gun violence in this country and it tells the world that LegalShield places very little value on human life. I’m also deeply troubled to see your are helping individuals establish trusts for the purpose of acquiring fully-automatic machine guns. During a year when Americans nationwide are coming together with bold new ideas to reduce gun violence and prevent the suffering of families, you seem intent on doing the opposite. Drop your Gun Owners Supplement plan immediately. If not, I will make sure every member of my community knows how LegalShield has responded to the Parkland tragedy and so many other gun-related horrors. Once you contacted Jeff Bell, fill out the three fields above and click the orange banner above to report taking action!